Popping in for a quick rave post! I wish I had the energy to be more detailed, but we are busy with school stuff and spring colds. 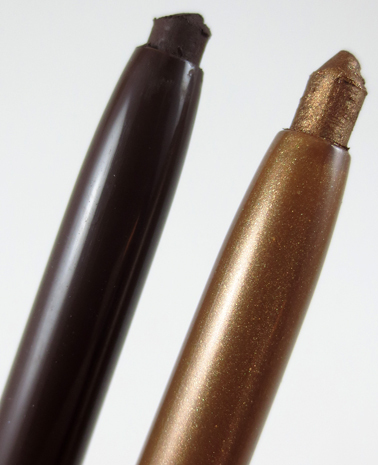 However, the Essence Cosmetics Long Lasting Eye Pencils are something everyone needs! Essence Cosmetics has several different types of eyeliners: sharp-enable pencils, markers and these beauties which are self advancing, no sharpener needed...my favorites!! The formula of the Essence Long Lasting Eye Pencils is soft and very easy to use. They aren't dry feeling, nor do they tug or pull as you apply. They feel amazing! They very much reminded me of the texture and consistency of an Urban Decay 24/7 Glide On Eye Pencil. The two colors I bought were Hot Chocolate, a dark rich matte chocolate brown and Bling Bling, a shimmering golden copper. These liners aren't just good for a budget brand, they are good period. I used MAC Technakohl in Photograuve for years and honestly the texture and payoff of the Essence is just remarkably better...by a wide margin. And you are paying $2.49 compared to $19.50. I find these to be very long lasting. They look essentially unchanged at the end of the day. I get a little minor fading under the eye, but that's normal for me and no worse then any other eye liner I've used. Essence Cosmetics Long Lasting Eye Pencils are currently available in 8 shades. I plan to go back and buy them all. 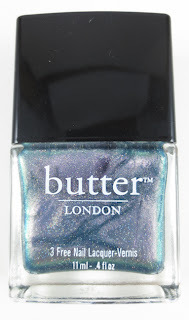 Quite a while ago, I got in on a really great deal on 3 bottles of Butter London Nail Lacquer. This was my first foray into the Butter brand and I was really excited to try them out. I'll admit, when I received the package, I was bummed out when I saw Knackered. I felt like I already had 4 of this same color, but I was about to be surprised. Butter London Knackered is described as "a sheer, twinkling oyster shade flecked with micro glitter particles"
In the bottle I'd say this reminds me more of abalone, then oyster. It is a duochrome that swirls with blues, greens and violets with tiny bits of multi-color glitter. SNAP! All of a sudden this color comes to life. It shifts strongly between violet, blue and green. You can see how when the nail is turned, the green starts to take over and the violet becomes far more subtle. It is a truly beautiful effect. 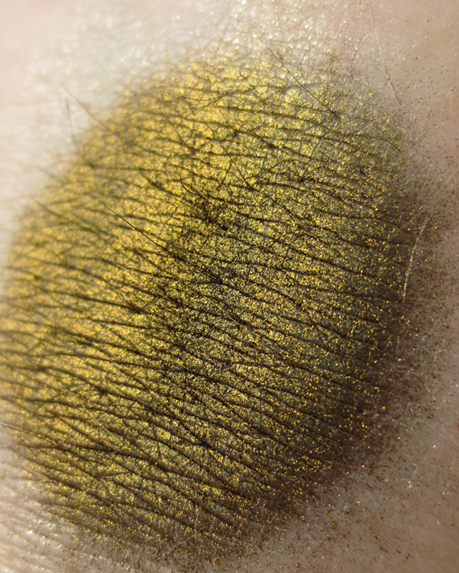 What sets this apart from some other sheer duochromes is the micro glitter throughout. While it looks a bit coarse here, the effect is quite smooth and looks a bit like stars, especially when layered over a black base. 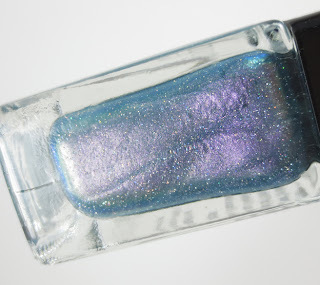 It's like a galaxy mani in a bottle. 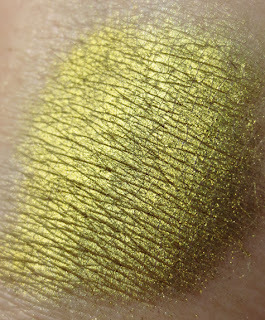 I like the color, I love the glitter effect, but the verdict is still out on the formula. 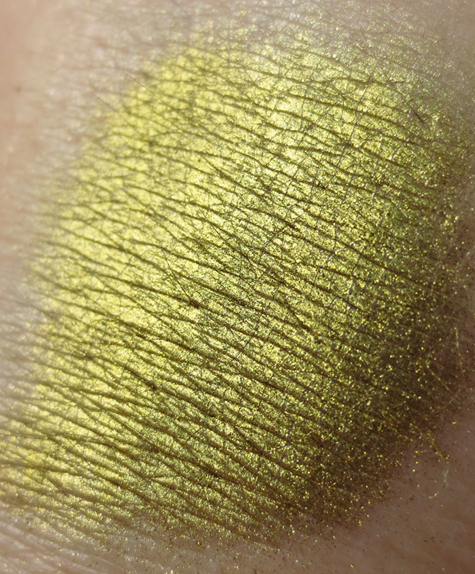 I've only tested a few, but I've noticed a tendency for their glitter polishes to flake and chip around the edges. Butter London Knackered is not as a big flaker as some, since you can use so little of it when applying over another base. For the $15 price tag, I wish I was more sold on the formula and the uniqueness of the color. I do think if there was a reasonable sale, I would try more. They have some colors that look achingly beautiful. Dosh anyone? Ever since I I started following beauty blogs a few years ago, I've seen Reviva Labs reviews and heard raves about their products. A few months ago, I was given the exciting opportunity to use and review a few Reviva Labs products. One area I specifically wanted to target was tired, dull looking skin. Cause face it, none of us are getting any younger. The wonderful people at Reviva Labs suggested I try the Non-Chemical Light Skin Peel. This product was provided for me to review, all opinions are my own. 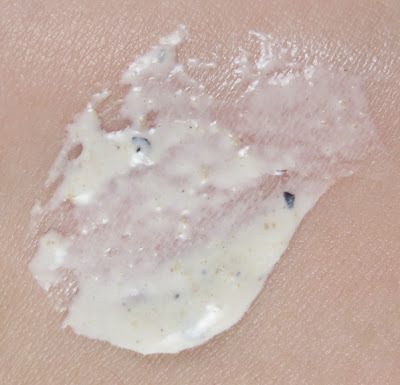 From the Reviva Labs website: "Peeling" is a European term for one of the most unique European items in the entire cosmetic field. THIS IS NOT A HARSH CHEMICAL PEEL. It doesn't "peel skin" as we know it, but gently lifts off more hardened, dried skin cells than can be achieved by scrubs or any other "exfoliating" product. I am only 38, but I've started to see big changes in my skin. My complexion is uneven, dull and looks lifeless. I've also noticed an increase in milia across my cheeks. One of the least invasive ways to remove milia is to let them naturally exfoliate themselves as your skin sloughs off and is renewed. So you can see where a peel that helps accelerate that process would intrigue me. The texture and consistency is so cool, I really can't stop playing with it. It is hard to describe, imagine you mixed a cold cream, a scrub, and the glow in the dark slime we all loved as kids, minus the glow of course. It's not sticky, rather it is very elastic. You can see in the image above how elastic the product is. It has a fairly strong smell. It would appear this comes from the Oil of Thyme listed on the ingredients. It has an ever so subtle mediciney smell underneath the Thyme, but nothing overpowering. I would describe it as an herbal astringent scent. I quite like it myself. The directions state you should apply a light coat over the face and let dry 3-5 mins. The product applies quickly and easily and you have a few seconds to spread it out before it dries down. There is a pleasant cooling/tingling sensation as it dries. After 3 mins you will be amazed how much this tightens your skin...I mean crazy tight. My son asked me a question and I could barely open my mouth enough to form words. I think it actually kind of freaked him out. However, at no point did the peel crack or crease. That was a huge plus as any sort of mask usually bugs the hell out of me as it dries. Per Reviva Labs, you can remove this product a few different ways: rub it off with your fingers, a dry wash cloth or a cosmetics sponge. I tried them all and I recommend the finger method. Dry wash cloths were too rough and abrasive for my skin, wet ones melted the peel and negated the exfoliating properties. Cosmetics sponges were too small and I struggled to get the product off. Fingers were perfect. 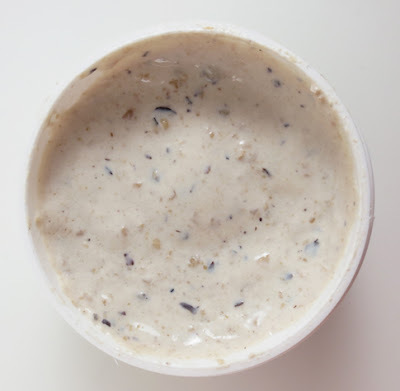 The mask balls up easily and the bits of almond gently exfoliate as you go. The almond pieces are not jagged so they don't feel like they are tearing you up as you remove the product. I found it is pretty easy to peel this product off your skin, even though you want to manually exfoliate. When I was a child I used to be obsessed with putting Elmer's Glue on my palms and then letting it dry so I could peel it off, like a second skin. That is exactly what this felt like after it dried. OMG, I wanted to peel it off so bad, major grade school flashbacks. Might need to make a run for some Elmer's Glue. Once the peel is completely removed I did not notice any sort of residue, film or greasiness on my skin. My skin felt soft and clean. So does it work? Yes, it totally does! 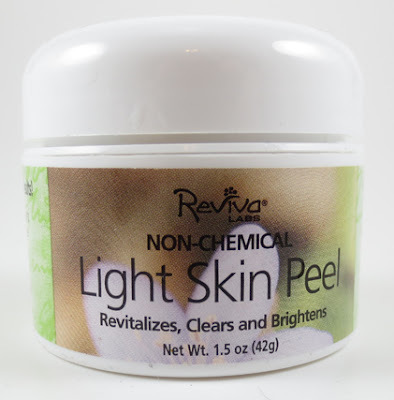 After using the Reviva Labs Non-Chemical Light Skin Peel once weekly as suggested my skin feels softer, tighter and brighter and I don't have as much flakey skin around my nose and mouth. After a few uses I've also noticed some diminished pore size on my cheeks. I haven't used it long enough to see if it will improve my milia, but given the results I've seen thus far, I think it will. This is a product I would buy again. I've been very pleased with the products I've tried and I plan to buy some of Reviva Labs other skin care products as well. I am consistently struck with how unique their products are, sometimes in ways that aren't obvious or easy to articulate. They have a staggering catalog of products for all sort of skin care concerns. You are sure to find something to get excited about. Finding Hard Candy Nail Polishes has been tougher then finding proof of Bigfoot. I have access to several retailers that sell Hard Candy and every single one looks like it was on the wrong end of the beauty apocalypse. So, when I finally stumbled upon a nearly intact display, I pretty much cookie monstered my way through the entire thing. One of my must have polishes was Hard Candy Crushed Chromes: Crush on Lava. 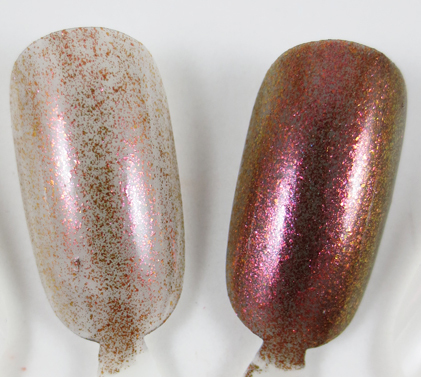 Hard Candy Crushed Chromes: Crush on Lava is a charcoal based fiery polish with color shifting properties. It shifts between shades of wine, greens and golds. It is a lively and interesting color. 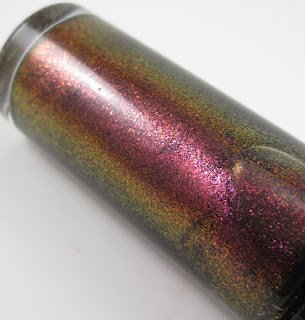 However, layer this polish over a black base and you really see what this beauty can do. This shows 1 coat over the top of Wet 'n' Wild Ebony Hates Chris. My collection is shockingly light on duochrome type polishes, so this was a nice addition. The formula of this polish is pretty thin, however since this is best used layered over a dark base, the thinness is a good thing. 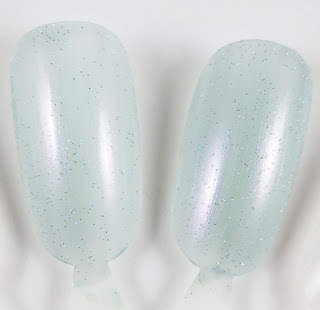 It also means this polish is only as good as the base color you use. I experienced no chipping of this polish. It grabs that base color and doesn't let go. One coat is all you need to get the fiery effect. I'll start by admitting that I've totally sucked about updates this week. My kids started off the week sick, then I got sick, now we are about to be knee deep in bark dust, so this weekend looks full as well. However, I am trying to get a few posts on deck and I thought I would start with 4 gorgeous shadows from Meow Cosmetics. 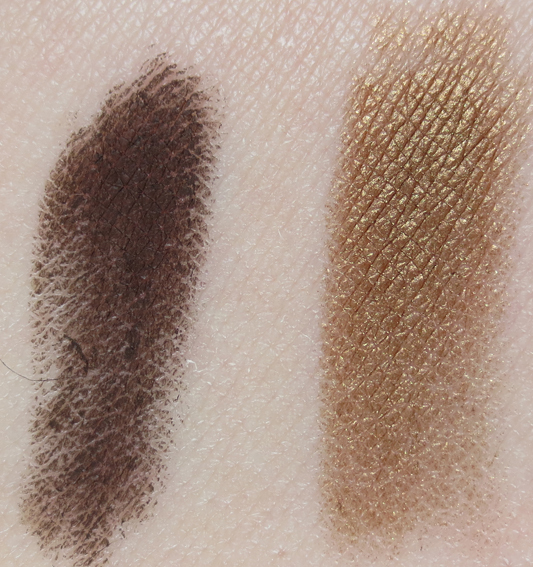 The four shadows I'm reviewing are from the Egyptian Treasures: Eye of Horus collection. Eye of Horus is a collection of rich metallic finished shadows. Meow Cosmetics has quickly become a huge favorite of mine. Their colors are beautifully pigmented and surprisingly complex. Take a look! Although I am not the world's biggest fan of metallic finishes, I really like these shadows. Pyramid is the knockout shade. It is lush, velvety and looks killer on the outer corner of your eye. 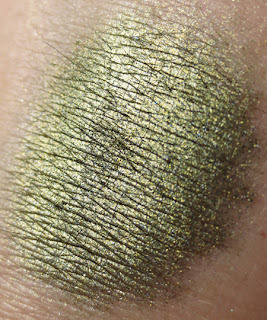 If you like to get your metallic on then I would grab up some samples of the Egyptian Treasures: Eye of Horus collection. I am back from oblivion! I have no big revelations about my absence, I was just tired and suffering from a huge lack of motivation. I pretty much frumped around all week in my Big Lebowski robe. I did however attend my very first women's roller derby match last night and it helped me regain a spark of energy. I figure I will ease myself back into the flow with Essence Cosmetics More to Love Lipstick. If you've never tried an Essence lipstick, they are really quite nice. They go on medium opaque, with a glossy finish and pleasant fruity scent. I've loved every shade I've tried. And with a $2.49 price tag, you can afford to take a risk. 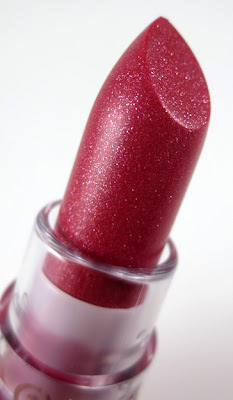 More to Love is a sheer berry pink with raspberry grainy sparkles. 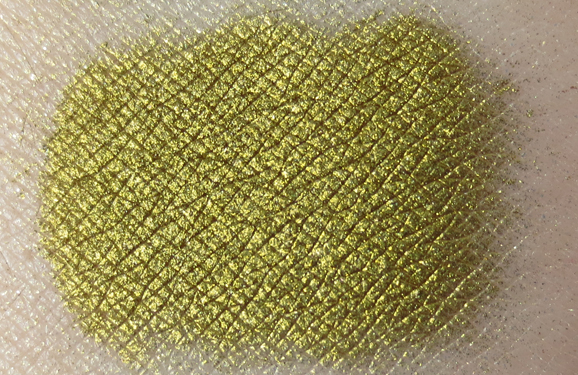 I say grainy, because I am not sure else how else to describe the "sparkle" in this shade. It looks pinky silver in the bullet, but on the lips leaves like little micro grains of raspberry sand. Is that clear at all? It's not as noticeable in person, but you can really see it in the images. It does not really feel gritty on the lips, but I get a feeling these sparkles may have worked better in a creamier, more opaque formula. 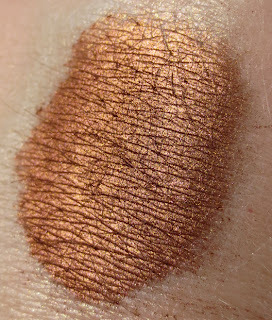 More to Love is not exactly what I expected from an Essence Cosmetics Lipstick. It is definitely more sheer then the other shades I've tried. It is a "my lips but better" shade that I think would be flattering on most people. I did end up liking the "sparkle". 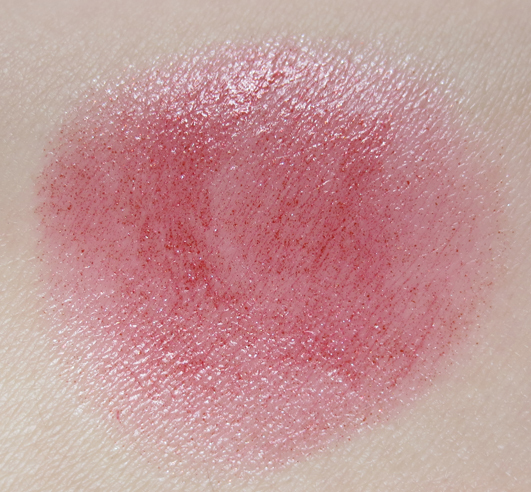 I think it gives the color a little kick and keeps it from looking like every other sheer berry lip butter on the market. The wear time isn't much, maybe 2 hours, but with a glossy, sheer shade, that is what I would expect. 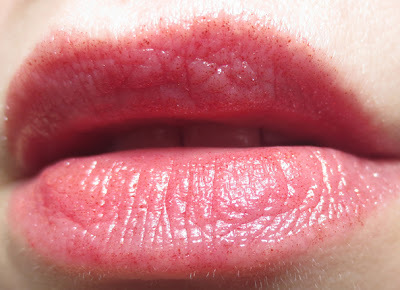 I did not experience bleeding or migration and it did not dry out my lips. If you like Essence Cosmetics lipsticks, More to Love won't lead you astray.